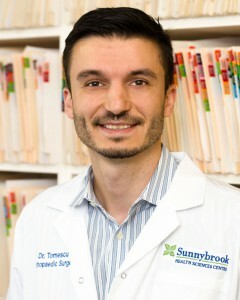 Dr. Tomescu completed his Orthopaedic Surgery Residency and a subsequent Clinical Fellowship at the University of Toronto. He was part of the distinguished Surgeon-Scientist Training Program (SSTP), and is currently completing a Masters program at the Institute of Medical Science, studying the effectiveness of functional knee braces after ACL injuries. His clinical practice focuses on lower extremity mal-alignment, osteotomies, patellar instability, and knee reconstructive surgery. Dr. Tomescu’s research interests include using biomechanical approaches to study risk factors for patellar instability, and using wearable technology solutions to enhance post-surgical recovery.